Q. 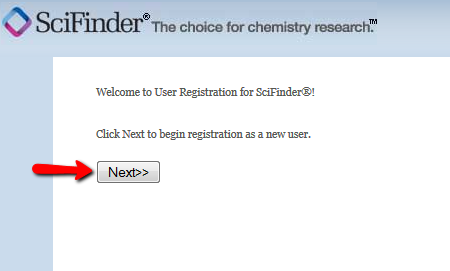 How do I register for a SciFinder account? 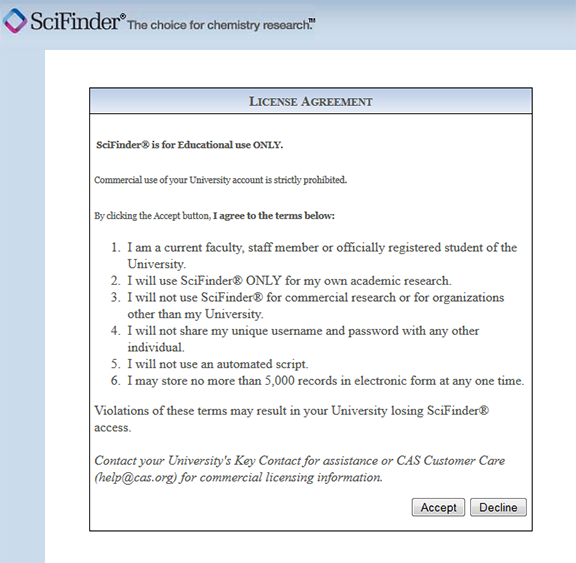 SciFinder is a premier chemistry database. It requires you to register the first time you use it. 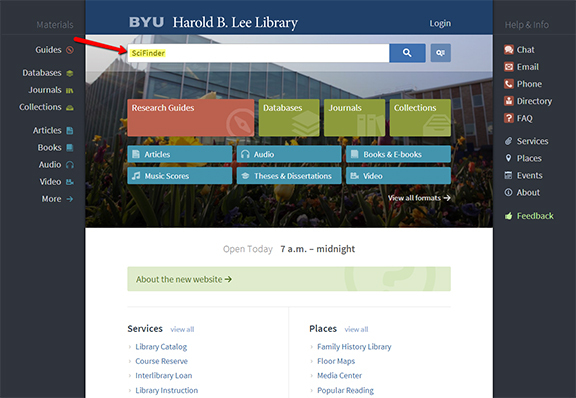 Go to the library's home page: lib.byu.edu . Type "SciFinder" in the search box on the top of the page and click the search button. Click on the hyperlinked promoted result for "SciFinder (Web Edition)" in the greyed box. Login with your BYU NetID and password. The next screen will display the message below. Click on the first hyperlink indicated by the red arrow. Please read the License agreement carefully. If you agree to abide by the License agreement, click the "Accept" button. Fill out all of the required fields of the registration form. Pay special attention to the note about filling in the email address. ***Important*** The email address must end in byu.edu or byu.net to be valid for this registration. Follow the next directions for obtaining a forwarding email alias. 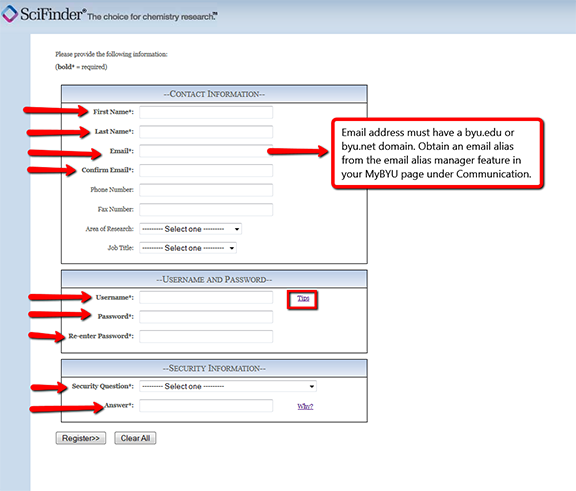 An email alias can be obtained by logging into your MyBYU account. In the campus links section, expand the Communication option, then choose the link for E-mail Alias Manager. Follow the directions for setting up an email alias. This functions as a forwarding account that will forward emails to your preferred email address. 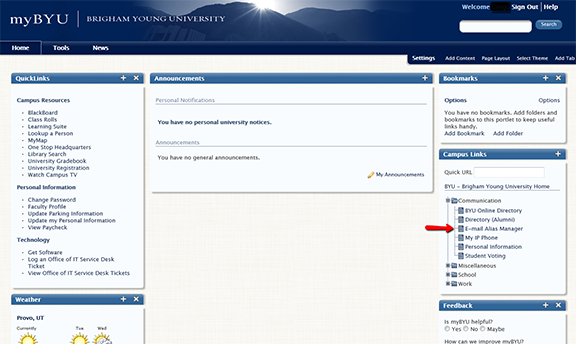 Once you have a BYU affiliated email address, create a username and password. This username and password is not affiliated or linked to BYU's password system. You must choose a unique username and password according to the stipulations set forth in the screenshot below. Once you have completed the registration form and clicked the "Register" button, you will get an email with a link that needs to be clicked on to activate your account. 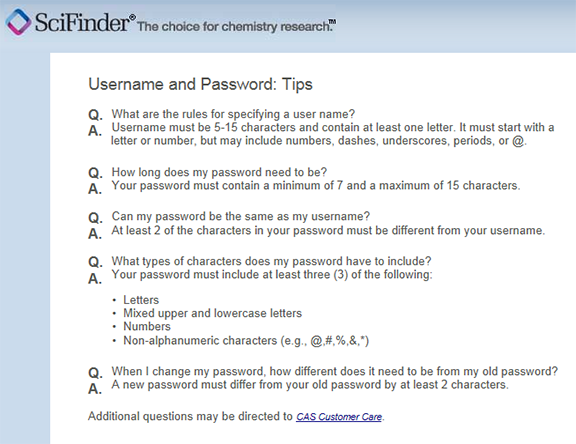 Remember, always access SciFinder through the library's home page as directed at the beginning of this answer. Please contact Greg Nelson if you have any questions (greg_nelson@byu.edu).